Graphic Circles Throw is ready! Easy beginner pattern with striking results. 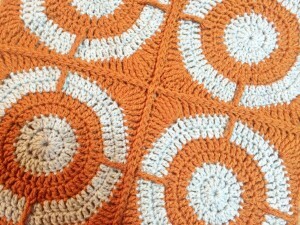 Simple bullseye circles with a twist – one single post stitch makes all the difference. A careful and minimalist join brings out the corner design, making for a modern and eye-catching throw. Two colors keep it simple, but make it your own with color changes. I used 6 skeins of Vanna’s Choice in Terracotta (170 yards per skein) and 5 skeins of Vanna’s Choice in Silver Heather (145 yards per skein) with an I hook but I am a loose crocheter. 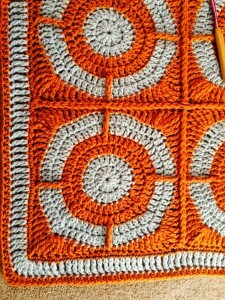 I recommend a J hook to achieve my gauge and size – the throw is about 52” x 68” with 48 motifs. 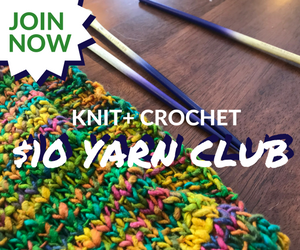 Join us for discussion, questions, pattern support, and brag photos on the Julie Yeager Designs board on Ravelry – all are welcome; I love to see what you come up with. Make a project page to inspire others! 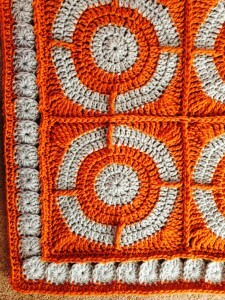 I would love to inspire beginning crocheters to complete their first afghan with this pattern. I am offering the pattern free with coupon code CIRCLES for the next three months. Offer expires April 30, 2015. If you like the pattern, spread the word! Please link back to this blog and do not share the coupon code. Share the link to my blog. Thanks! Thanks for your interest in my patterns; please see all my designs at my Ravelry Store. Comment on the blog – I’d love to see something to approve other than spam, lol. The border on the left is not included with the pattern, haven’t written it up yet. I love how geometric this one is. Thanks Julie! I have been jealously watching your testers make their test afghans, waiting eagerly for the pattern to be released! Thanks! I love your designs! I wish I had time to make them all. Saw this on Rav. Love it! It’s very striking and I’m looking forward to making it! Oh!!! 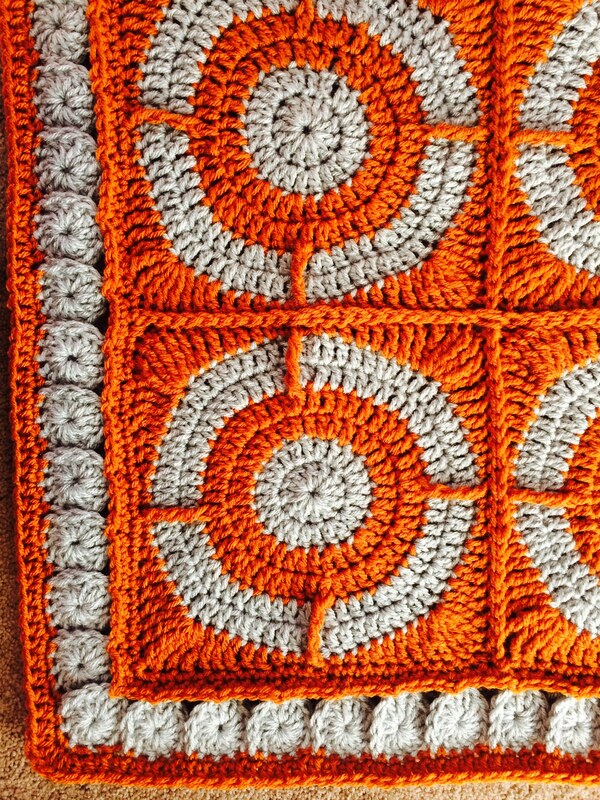 I love it… I like that I could take this project with me and make a pretty blanket. Thank you. I will visiting very often…. Cool. Very eye catching. Can’t wait to see the border pattern too. Thanks! 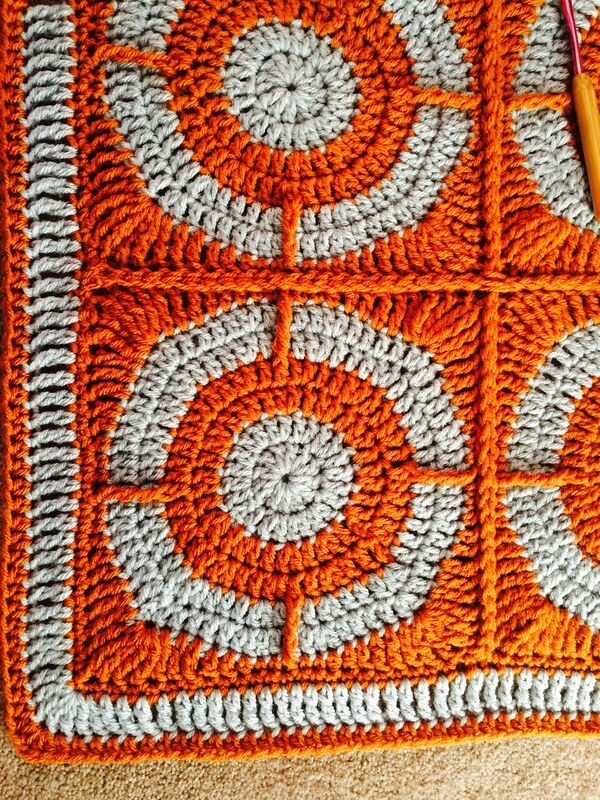 I finish up on 3 or 4 WIPs I will me crocheting this gorgeous throw. Thank you so much for offering this up to the community! I love the border of the first one displayed. When do you plan to add the pattern for it. Anxiously waiting. That is the one I want to use. It better matches the bullseye pattern in the main blanket. Thank you for this great pattern. I love your fresh designs. I really am a new crocheter. Loooong time knitter. I am finding crochet to be incredibly fun & satisfying. I very much appreciate your pattern sharing & encouraging newbies like me to try a large project. Thanks! I some rainbow neon colors and black yarn and this may make be the perfect pattern. Thank you! So fun! Its so generous of you to give away so many patterns, too bad tze EU had to change its stupid tax laws….I cant apply the code in Germany. 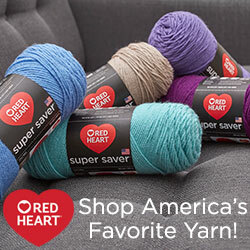 I will still be following your blog, i am a knitter and new crocheter. Love this pattern!! Cannot wait to get some WIPs done so i can work on this one. Thank you for all your great patterns! Julie, you are a genius when it comes to design. I have followed you for quite some time and have not seen a single thing you have done that has not been absolutely awesome. I look forward to see what will be coming off your hook next. This is a fabulous blanket and thank you for making it free! I plan to make it for either a child in hospital in the UK or a child with cancer in the developing world. Thankyou for the free pattern! I’ll put plenty of pictures on Ravelry. Can’t wait to see it, Jennie! Just love this! It’s hard to find a pattern appropriate for making for sons who are setting out on their own – this is perfect! Thank you, and please let us know when you have the border pattern ready. I think it completes the blanket so nicely.